Growing up, the family members I knew and saw on holidays were almost entirely the descendants of one man: Antonio Luigi Saviano. Most of us didn't know his name. 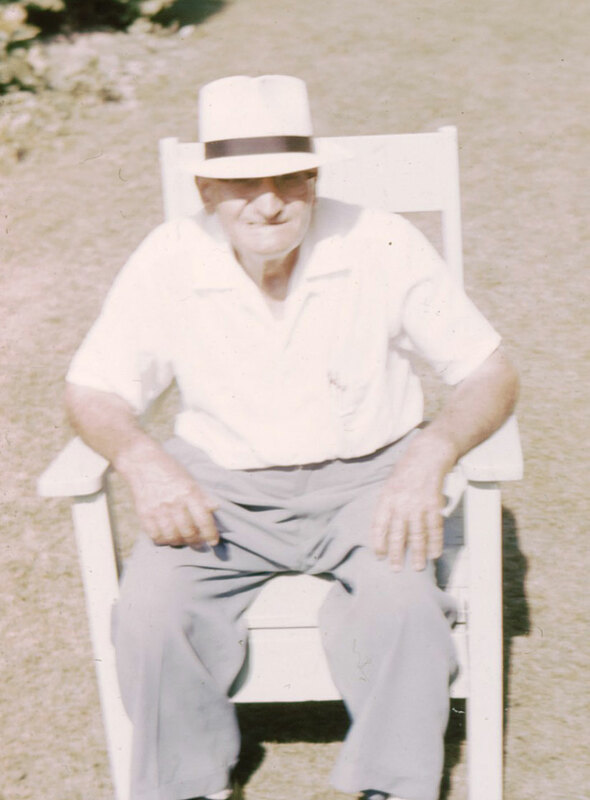 He was the father of our grandparent or great grandparent. 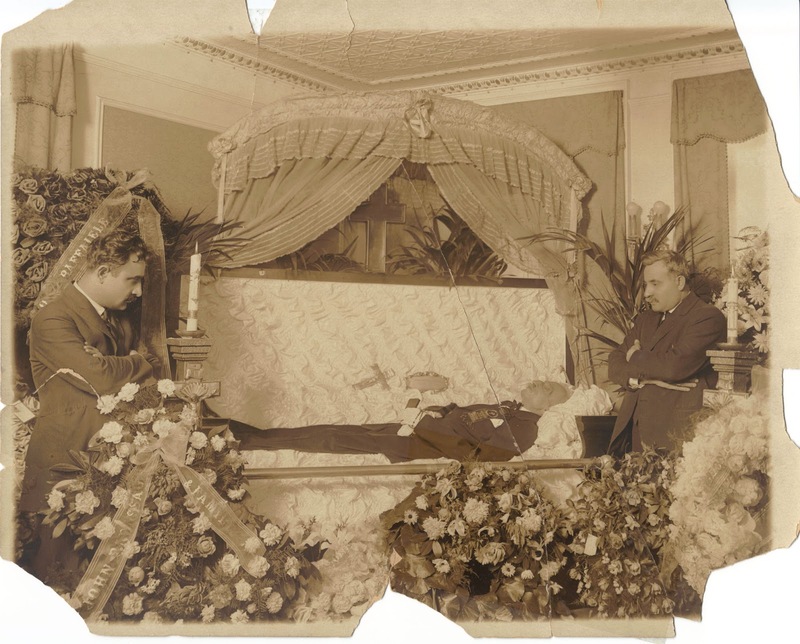 But four years ago my mother pulled out a photo of Antonio lying in his coffin. He died in the Bronx, New York, several years before she was born. 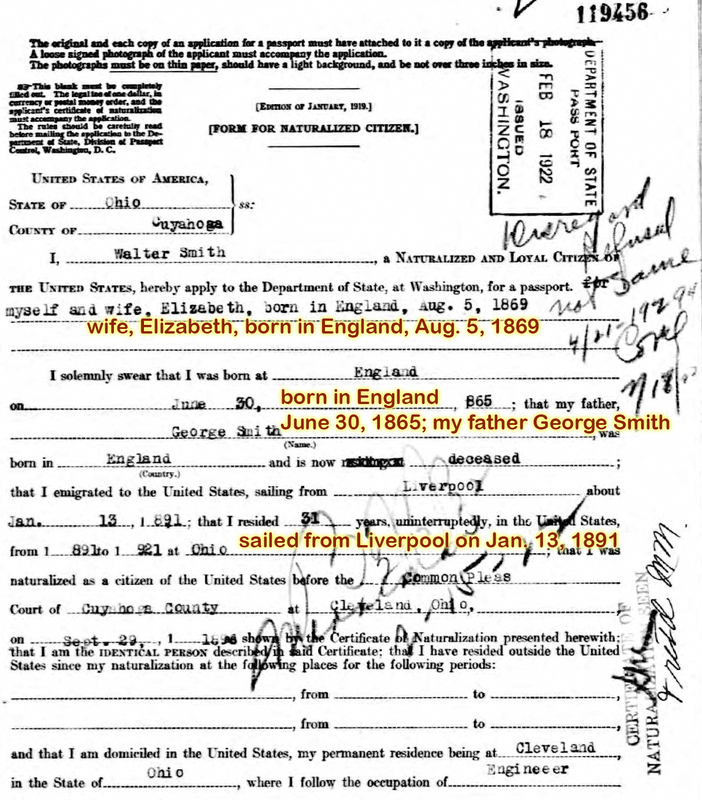 Was my first immigrant ancestor a shrewd businessman? I'd been researching my family tree for about 10 years at that point. The branch of the family where I'd made the least progress was Antonio's branch—the very branch I'd known my whole life. 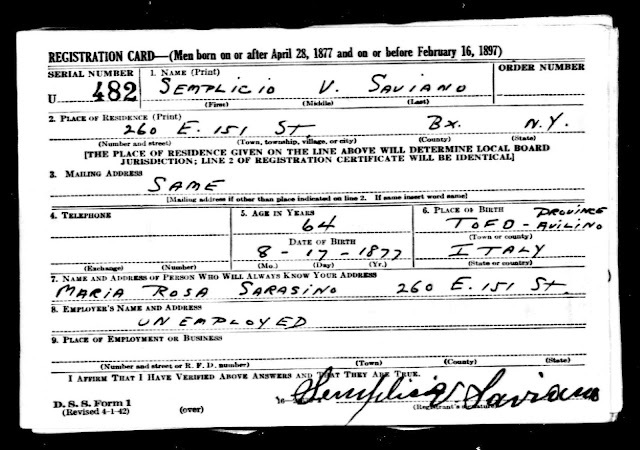 According to his World War II draft registration card, their son Semplicio was born in Tufo, Avellino, Italy. I had looked at microfilm of vital records from Tufo. I found Semplicio's birth and the earlier birth of a son—Raffaele Vitantonio Saviano. I knew this baby did not survive because it was a younger Raffaele who came to America in later years. Antonio and Colomba moved less than 10 miles from Tufo, Avellino, to Pastene. Pastene is a small section of Sant'Angelo a Cupolo in the neighboring province of Benevento. They had 3 children there: my great grandmother Maria Rosa, Raffaele, and Filomena. It was in Pastene that Maria Rosa met and married my great grandfather, Giovanni Sarracino. They had their first child there, but he did not survive. Antonio began travelling to America in 1890, three years after the birth of his youngest child. He was my first ancestor in any branch to do so. He was 47 years old at the time. That's a bit on the old side for the first of his three cross-Atlantic trips. He brought his son Semplicio to America and left him there. Then in May of 1898, Antonio returned to the Bronx with his wife and his children Raffaele and Filomena. The family left for America one month after the marriage of my great grandparents. That means my great grandmother did not have her family there to support her when she gave birth to her son Carmine in December 1898. And she didn't have their support when Carmine died a short time after. Let's stop there for a moment. Something strikes me about my great grandparents and their ill-fated baby boy, Carmine. Maybe my great grandparents never planned to come to America. Baby Carmine was born just shy of eight months after their wedding. There was nothing stopping them from coming to America with the rest of the family. Maybe it was only the shock of Carmine's death, and his possibly premature birth, that drove the couple to leave their home. Maybe if Carmine had lived, I would be an Italian national. That aside, let's look at what I learned about my great grandparents Antonio Saviano and Colomba Consolazio this year. 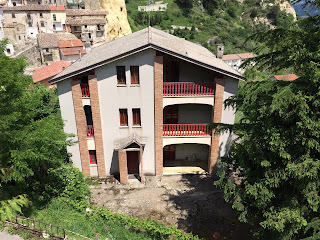 Working backwards from the Tufo births of their children Semplicio and the first Raffaele, I discovered that Colomba had two brothers living near her in Tufo. I found the marriage record for one brother. His place of birth, and the town where his parents still lived, was not Tufo. It was the neighboring town of Santa Paolina. My next step was to view microfilm of the vital records from Santa Paolina. Sure enough, I discovered that Antonio and Colomba were married there. They had a baby girl before Raffaele and Semplicio named Maria Grazia. She died after four days. Colomba was born in Santa Paolina, but her real name was Vittoria Colomba. I learned her parents' names and her grandparents' names. And on their marriage documents I learned the origin of my great great grandfather, Antonio Saviano. He was not born in Santa Paolina where he married and began his family. He was not born in Tufo where he moved and had more children. He was born in Pastene! The very town to which he returned, had more children, and from which he left for America. Antonio Saviano, my first ancestor to come to America, travelled in lots of circles. He went from Pastene to Santa Paolina to Tufo to Pastene, completing a very small circle. He went to America and back to Pastene three times. Finally, he brought his family to America and settled down…age of 55! Antonio lived to be 82 years old. He outlived his wife Colomba by five years, but he died surrounded by this four surviving chlidren. had his "own income" by the time of the 1910 census. Was Antonio an independent businessman? 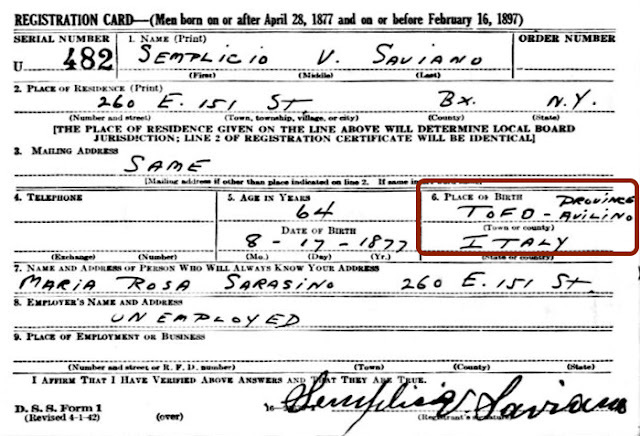 Are his accomplishments the reason his son Semplicio and my great grandfather Giovanni Sarracino became the owners of apartment buildings and agents for a local brewery? Was Antonio a wheeler and dealer? What was the source of his "own income"? It may be nothing, but his cause of death was a toxic infection of the kidneys and the heart's inner lining. Were these infections related to the Bronx's underground beer cellars of the time, owned by the breweries with which his son and son-in-law did business? I've often wondered if my family owned those particular apartment buildings because of their access to the beer cellars. This would make them good partners for the breweries. The discovery of Antonio Saviano's origin and travels shed a lot of light on him. But now I find I have a ton more questions. I think it's time for some Bronx brewery history lessons! You know that guardedly ecstatic feeling when you think you're looking at the answer to your biggest family tree mystery? Should you shout out EUREKA! or keep reading the document you've found to make sure you've got it right? This happened to me a few times today, and I was giggling with joy! I had his death photo. Now I have his birth and marriage records! Recently, I filled out my chart of direct ancestors, color-coding the names to correspond to each of my four grandparents. That's when I realized I hadn't gotten further than my third great grandparents on my maternal grandmother's branch. And those names were from an unreliable source. I needed to find Italian documents for my grandmother's grandparents: Antonio Saviano and Colomba Consolazio. Only then could I be sure of their parents' names. And maybe I'd learn their grandparents' names. My great great grandfather Antonio Saviano presented me with another problem besides his ancestors' names. 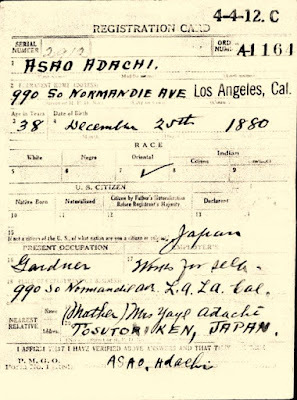 I didn't know where he was born, and he seemed to move a few times before coming to America. 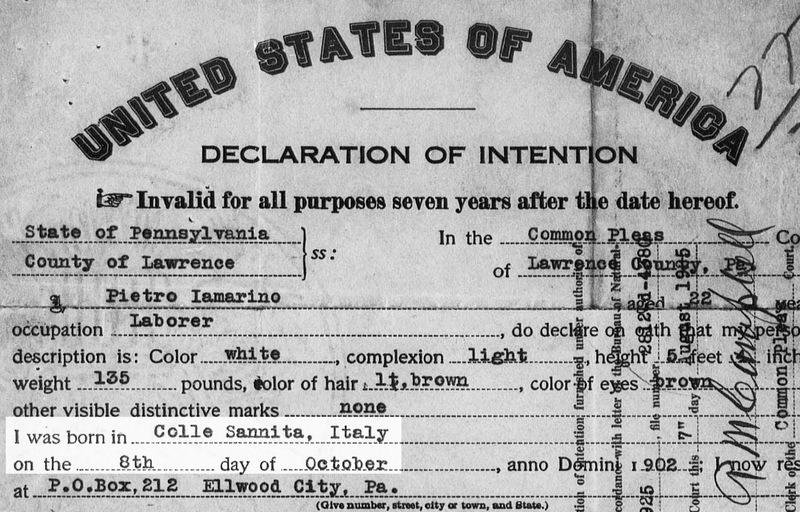 I haven't found any other Italian family in my tree that moved more than once in 1800s Italy. The Saviano and Consolazio origins were my only brick wall. First I found Antonio and most of his family on an 1898 ship manifest coming to New York. They stated they were from Sant'Angelo a Cupolo. That's a little town in the province of Benevento. But I'd always heard they were from Avellino. Next I found the World War II draft registration card for Antonio and Colomba's son, Semplicio Saviano. It said he was born in Tufo, Avellino, Italy. Great! Now I was onto something. Then I ordered microfilm of Tufo vital records to view at my nearest Family History Center. I found that Antonio Saviano and Colomba Consolazio had a son before Semplicio named Raffaele. I looked in the Tufo microfilms for Antonio and Colomba's births and marriage. But they weren't there! Thanks to Colomba's brother's marriage records, I discovered that the Consolazio family came from the neighboring town of Santa Paolina. So, with only days left to order microfilm, I ordered four reels from Santa Paolina, Avellino, Italy. Today I went to see them. I immediately set out to find Antonio Saviano's 1843 birth record. It wasn't there, and I was disappointed. but I continued looking. I wasn't sure at first, so I kept quiet. 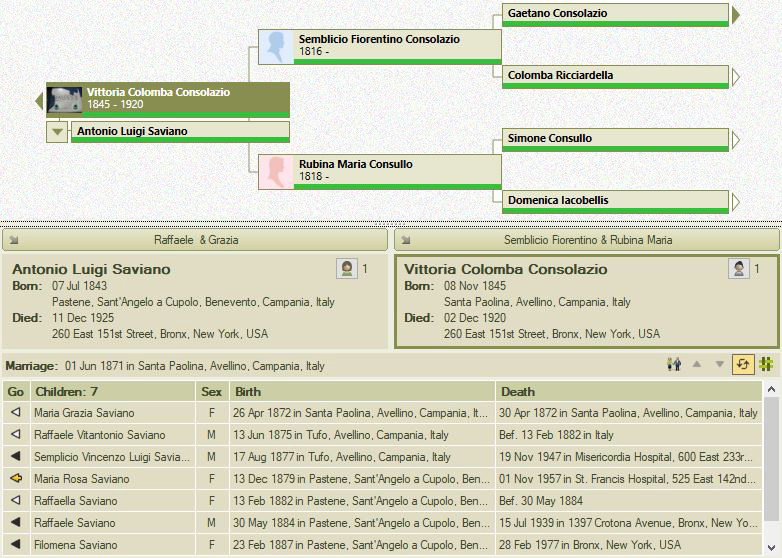 But there I was, looking at Colomba Consolazio's birth record. My great great grandmother was not born on the date I saw on her death record. She was born three years earlier, and her name was Vittoria Colomba Consolazio. 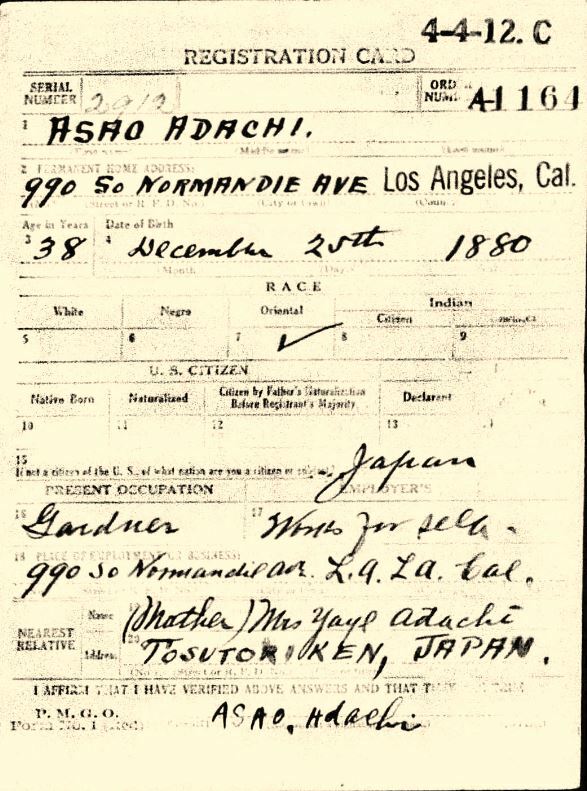 There was an extra paragraph in the center of the birth record. It stated that Vittoria Colomba Consolazio married Antonio Luigi Saviano on 1 June 1871 in Santa Paolina! I rewound that reel of film faster than I thought possible. I had to get to the 1871 marriage records ASAP. And the bricks came tumbling down. When I found the marriage banns and marriage record, I had an answer I never expected. Antonio Luigi Saviano was born on 7 July 1843 in Pastene. Pastene is a small section of Sant'Angelo a Cupolo in Benevento! That's where the family was living before they came to America. That's where my great grandmother and her younger siblings were born. So Antonio was born in Pastene, moved to Santa Paolina to marry Vittoria Colomba, had one baby who died at four days of age, moved to Tufo to have two more children, and moved back to Pastene to complete his family. 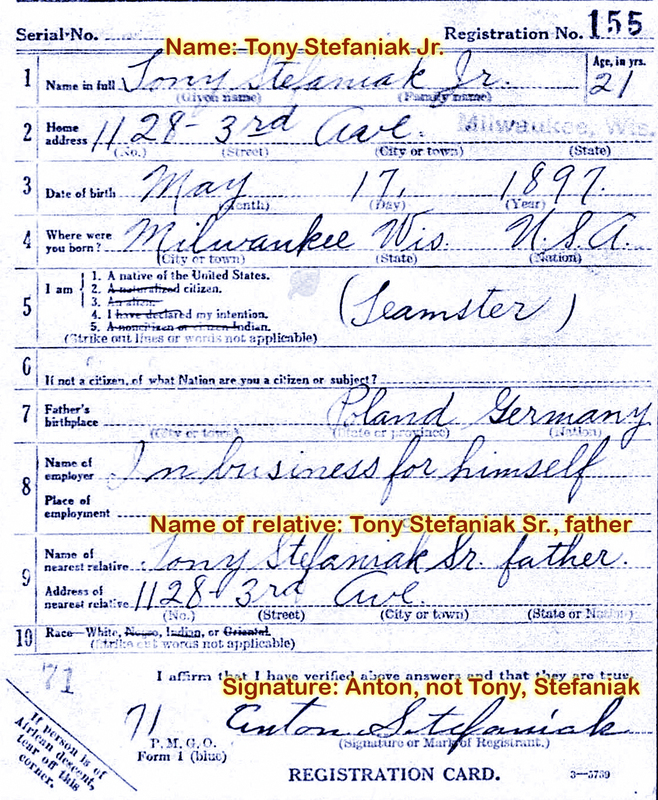 I learned Antonio's parents' names were not what I saw on his death certificate. They were Raffaele Saviano and Grazia Ucci. Grazia died before 1871. I learned Antonio's birth date and his town of birth. I learned Vittoria Colomba's real name, real birth date, and her parents' full names. These facts were almost entirely wrong on her death certificate. Her father was Sembricio Fiorentino Consolazio, son of Gaetano who was the son of Saverio. Sembricio's mother was Colomba Ricciardella. Finally, I learned about Vittoria Colomba's mother. On her death record, her mother was Rafina Zinzaro. In the Tufo documents, she was Rufina Zullo. But on an 1818 birth record I discovered Rafina Zinzaro / Rufina Zullo was born Rubina Maria Consullo (sometimes written as Conzullo). Her parents were Simone Consullo and Domenica Iacobellis. During my visit today I jotted down the facts for every Consolazio I could find, and I will go back to finish that work. Suddenly my family is much bigger thanks to the Consolazio ancestors that had been hiding behind that brick wall. Now it's time to scour the Pastene and Sant'Angelo a Cupolo records I downloaded to get the facts on every Saviano and Ucci. Can I shout EUREKA now? EUREKA!!!! Maybe I remember a long drive from New York to Ohio to visit my great grandparents when I was five. Maybe I have a single image in my mind of great grandma's kitchen. But that's it. Before I began researching my family tree, I knew next to nothing about my great grandfather Pasquale Iamarino—or Patsy Marino, as he was known. He lived in Ohio and worked for the railroad. Nothing more. Genealogists enjoy piecing together our ancestors' paper trails and mapping out their locations. If we're lucky, we can wind up with enough facts to bring our ancestors back to life in a way. 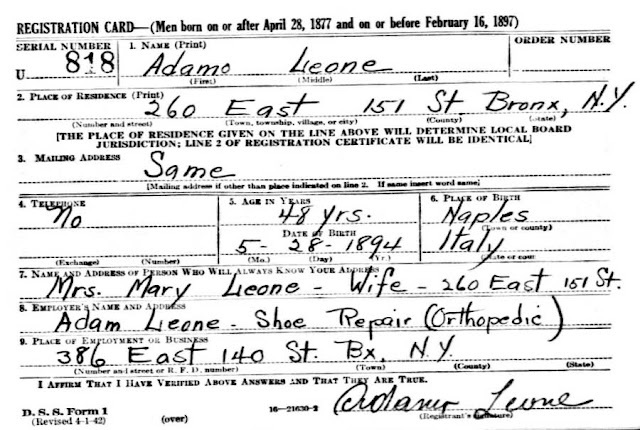 Italian church records from the 1880s told me that Patsy and my other paternal great grandfather were second cousins. A ship manifest told me that Patsy came to America at age 20, heading first to his uncle in New York City. Four years later, in 1906, he was working for the Erie Railroad in Steuben County, New York. In the rail yard he must have met the Caruso brothers who came from a neighboring town in Italy. 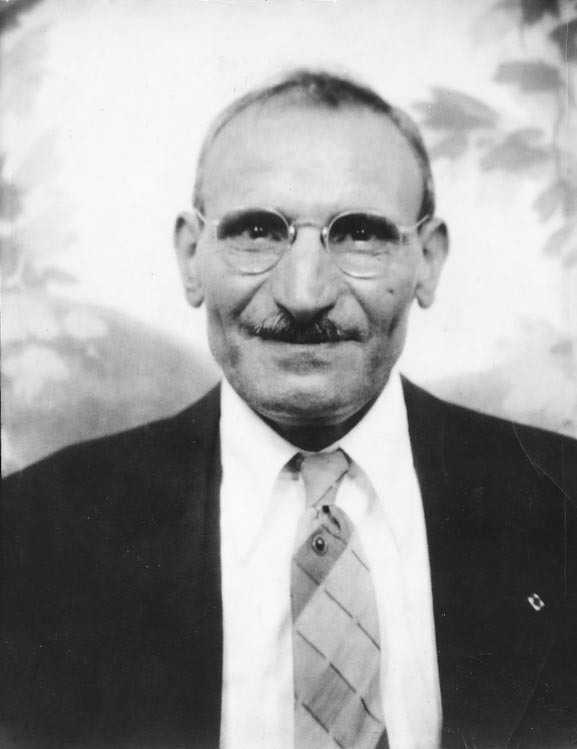 By late 1906 he married the only sister in the Caruso family, in Hornellsville, New York. Hornellsville was a boom town at that time, achieving city status that year, thanks to the railroad. When my grandmother was born in 1908, Patsy and his little family lived at 95 Front Street—a short walk from the railroad station. Between 1910 and 1914 Patsy moved to Albany and continued working as a railroad laborer. Then, suddenly, in 1918 Patsy registered for the draft in Youngstown, Ohio. Perhaps he had to move to keep his job. 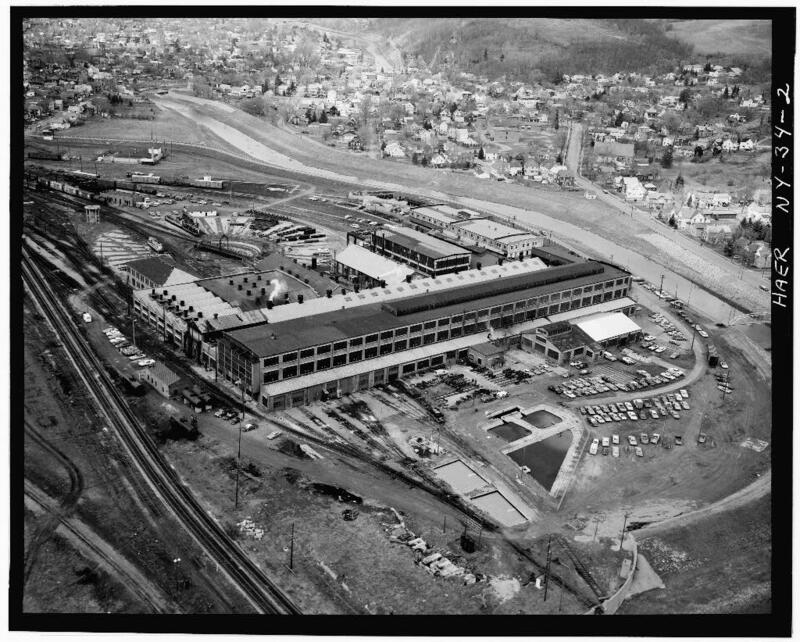 He was a boilermaker for the Erie Railroad, working in the railroad roundhouse in the 1920 and 1930 census. City directories show him on Dearborn Street in Girard, Ohio in the early 1930s. This is the same house I feel as if I remember. By 1940, at the age of 58, Patsy retired. I'm closing in on 58 and wish I could retire! But my dad recently told me that Patsy had to retire because of lung issues. Did all those years as a boilermaker give him something like black lung disease? According to the International Brotherhood of Boilermakers, "Railroad Boilermakers service and repair locomotives, and manufacture parts, including hundreds of items used every day in the railroad industry. They also perform welding on tracks and general maintenance work." With today's worker safety rules, a boilermaker probably isn't at any risk of lung disease. But something incapacitated Patsy in his fifties. He lived to be 87 years old. During his long retirement, Patsy enjoyed tending to his garden and his roses at the house on Dearborn Street. I wish I could remember him.